Our Life Is Like Our Breath? The filmmaker himself lived for some time amongst the mostly western forest monks, and succeeds in showing, from an insider view, the spiritual practices which Buddha set down 2500 years ago. Swiss Television “Sternstunde Religion”, (Religious Highlights), was unanimously positive. At the “Buddhism in Film” festival in Wiesbaden (Febraury 2000) the film was excellently rated, and was judged, extraordinarily good, by audience and press alike. Besides the main buddhistic philosophy (Theravada) and the monasterial life, this film also shows Thailand’s social structures very impressively. In addition, one accompanies the forestmonks to a smaller monastery in a national park on the Mekong river, the border river to Laos. One of the highlights of the film, is the the monks’ jungle retreat in the far west of the country, very near to the border with Burma (Myanmar). This malaria infested national park, is home to the famous river Kwai, which flows through it. Here the audience becomes a witness, to how the head of the monastery, a canadian and environment activist, is engaged in the fight to stop the last jungles of Thailand being cut down and cleared by fire. The main monastery of the forest monks, the Wat Pah Nanachat, was founded in 1975 by the well known buddhist master of meditation, Ajahn Chah, for the increasing number of his western disciples. Under his guidance, more than 100 monasteries have been established, some of them in western countries such as England, Australia, Newsealand, Switzerland, Italy and the USA. In England, there are already 4 monasteries in this tradition! 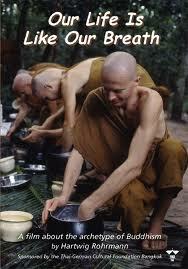 The first head of the forest monastery, Wat Pah Nanachat in Thailand, was an american, Ajahn Sumedho. He is now the spiritual head of the international Forest Sangha and the corresponding buddhist center in England, the Amaravati. Hartwig Rohrmann, born in 1949, cameraman and filmmaker. After taking his university degree in 1971, he did an apprenticeship with Artfilm Pit Koch, a well known documentary filmmaker. After that he continued his training at Bavarian Television and the Bavaria Film Studios to become a cameraman. In the early years, during the winter months 1972/73 he undertook longer trips to India, Nepal and Sri Lanka, where he also visited various spiritual centers, for example the Sri Aurobindo Ashram in Pondicherry. In the Eighties he frequently visited South East Asia where he practised under Buddhadasa in the Wat Suan Mokkh monastry in Thailand. He was also involved in the “Spirit in Education Movement” with Sulak Sivaraksa. 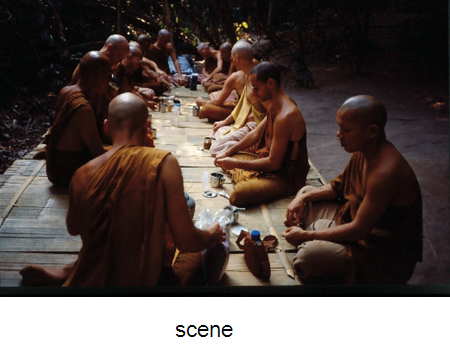 The film of life in the Monastery, and the last film documentation of Ajahn Chah were realised after he had taken part in a rain retreat in the Wat Pah Nanachat monastery.